With innovative online cyber security degrees, industry connections, and an award-winning competition team, UMUC is a leading name in cyber security education. The rapidly expanding realm of cyber security offers a wealth of career options. University of Maryland University College's bachelor's degrees, master’s degrees, and certificates are designed to help you gain the technical skills, knowledge, and expertise you need to unlock your potential and specialize in the cyber security field of your choice. With our Program Comparison Tool, you can evaluate as many as three degrees, specializations, and certificates side by side. Explore program descriptions, cost, transfer credit, program formats, course content, and more. Found your program? Use our Time and Tuition Estimator to get your estimated tuition, fees, and graduation date. 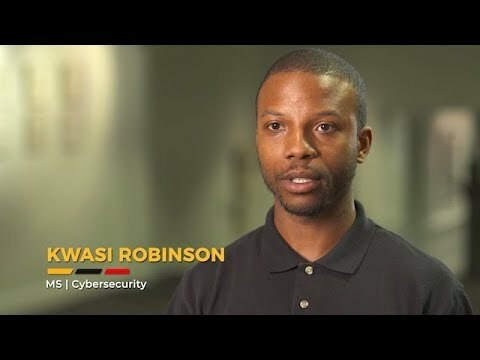 Why Study Cyber Security at UMUC? Cyber security at the forefront: At UMUC, cyber security is the focus of our program, not an aside. We offer a broad array of cyber security bachelor's degrees, master's degrees, and certificates—in subjects ranging from digital forensics to cyber policy. Where the jobs are: Maryland's cyber security network includes 12 major military installations; 400 Federal, academic, and private research centers; and 50 Federal agencies. At the epicenter of cyber security: UMUC is headquartered between the DoD's Cyber Command in Maryland and the Cyber Corridor in Virginia. Cutting-edge curriculum: Our cyber security curriculum is continually updated and designed with input from leading employers and cyber security experts. Taught by faculty in the know: Many UMUC cyber security faculty members are experts in the field, providing you access to industry leaders. Global campus: UMUC was founded to meet the needs of working adults. Take courses online knowing that your education is backed by the reputation of a public state university. Hands-on experience: UMUC's virtual cyber security lab gives students the opportunity to attack and defend online in a safe and secure environment. Globally-ranked cyber security team: The UMUC Cyber Competition Team provides students with real-world experience and networking opportunities. UMUC has been designated as a National Center of Academic Excellence in Information Assurance and Cyber Defense Education by the National Security Agency and the Department of Homeland Security and as a National Center of Digital Forensics Academic Excellence by the Defense Cyber Crime Center Academic Cyber Curriculum Alliance. D.C. and Maryland high school science, technology, engineering, and math teachers can apply to our summer camp for cybersecurity curriculum development. Applications are due May 13. Not only am I in a very hot field, I'm also in a good company where I feel secure, and I like what I'm doing a lot. And I feel like I'm [adding] value not just to myself but to the country and to the government…. I'm heading in the right direction for my career. After a brief stint as a technical recruiter for cyber security positions, I thought to myself, 'I could do this.' UMUC had recently started the cyber security master's program, and I figured it would be a great opportunity for me to get into the field. The only security that we've actually achieved in cyber security is job security. In Washington, D.C., especially, I think the unemployment rate for cyber security specialists is less than zero. They’re in great demand. And that’s true not just for government but for industry as well. UMUC is wired systemically into every part of CyberMaryland…. They have really become an epicenter or a proxy to connect students to the organizations, Annapolis, and, ultimately, the end jobs that they’re taking as a result of their education with UMUC. Maryland has a phenomenal ecosystem. With our unique cluster of cyber-related government, academic, and business entities, we have the building blocks to be a dominant player in the cyber security industry. Thanks to UMUC's Cybersecurity program, Kwasi Robinson and his team took first place at the MDC Three Cyber Challenge. Winning the Capture the Flag competition proved the strength of UMUC's curriculum in real world scenarios. The Center for Security Studies at UMUC provides educational resources, networking, and career training opportunities for working professionals pursuing cyber security education. Learn more about the Center for Security Studies by visiting the Administration section. Meet successful students and alumni in UMUC's cyber security programs who are gaining the skills they need to succeed. Find out how you could be part of the globally recognized UMUC Cyber Competition Team. Meet cyber security faculty members, who bring real-world experience and a career-relevant curriculum to the classroom. Our cybersecurity coursework is designed to help you earn valuable industry certifications. Find out why cyber security has become an essential part of information technology and law enforcement fields in the digital age.